It’s actually not so much about angles vs. curves, but about the general impression. Take someone like Christina Hendricks – you see her and your main impression is that of curves. It’s probably the first thing you notice, actually. 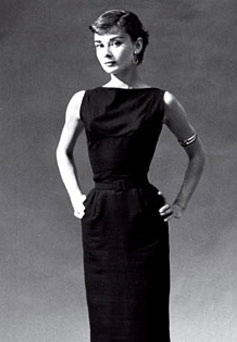 With someone like Audrey Hepburn, the curves don’t really register (and neither do angles, mind you) because you first notice the animated face. You do notice she’s a woman without getting the impression of curves, curves, everywhere. If you have someone with a 14-inch different between bust/waist and hips and it was curvy, it wouldn’t give the boyish impression Audrey does. That’s why I posted pictures of yin types with similar measurements. I am not flat-chested like Audrey, but my curves still don’t register as curves, even when someone is looking at my body and noticing it. Elizabeth Taylor had a distractingly beautiful face, and she is still renowned for her curves. Animated face or not, all of the Flamboyant Gamines (the book ones) the person working on this looked at showed the exact same shape of bust/waist/hips. And an SG would be just as animated as FG, but they still have curved lines in their torso. The point is not about the general impression here. What I am looking for is the commonality between people of the same type. Types have to have common body lines; otherwise, the same things wouldn’t flatter people across a type. I think the other thing is that maybe the yinner type bodies have more in-and-out both in profile AND front on, whereas yanger body types may have in-and-out front on, but less so in profile. Being curvier from the side instead of the front is an N trait, though, so while I think this would probably apply to Ds, for instance, it may not apply to FN. Actually, I meant that Ds (at least, and a lot of FGs it seems) can look like hourglass-y from the front, but not in profile- they don’t project in 3D if you like! I think it applies to D and some FGs, but probably not FN. So it’s more of a sharp yang trait, I think, rather than yang in general. Great post! As a person who loves the outdoors and wrestling with the grandkids and dogs, I have been experimenting quite a bit with the FG’s version of natural, with some success and some failure. It’s quite fun. I’ve just found this blog (a great read by the way!) and I am relieved I’m not alone in my style journey. I too have tried out SN and SG, but felt displaced because FG as presented seemed like you had to be very thin and lanky looking to be one. I’ve always come across as short, big thighs and upper arms, squared shouldered; boxy in all. And due to a bit of weight gain I can see my hourglass figure seems more prominent I.e. Bigger chest, fleshy behind. Though when I look at my bones I can see my hips are sort of straight and lean looking, and my ribcage waist area is small but my upper chest/arm area is broader. Which as you said, is kinda the main thing of an FG yet anyone with those traits are made to feel like they’re an outlier. I’ve learned quite a lot since I wrote this post, and I’ve had the chance to learn from David himself. What I would look at in your case is whether your have a larger bone structure. I have a smaller and sharper bone structure all around; I’m just carrying some extra weight. There are times when I *have* been very thin and lanky-looking. Basically, he says that there are SNs who are imbued with a kind of gamine spirit, and need this addressed in their clothes, but that they need the looser construction of SN. FG is still possible, of course; it all depends on what your yin/yang balance actually communicates and what you need from clothes. I realize this post is ancient, but I have an FG question! Can FGs have blunt Yang instead of sharp? I’m swinging wildly between FG/SN/SG/DC/SC on a regular basis. I’m 5’2″, with what I think is a Yang body type and bone structure (I have a Yang hip pad, high forehead, high cheekbones, very short waisted and not much of a waist) and Yin-ish features (medium sized eyes and lips, a “nice face” with a softer nose) but I don’t feel sharp enough for G/FG, but not curvy enough for the Softer types. When I look at my face I see bluntness rather than sharpness, but I don’t have the strong bone structure to give my clothes shape – I look better in tailored clothes, which seems to be the opposite of N types. I’m short, but I have a medium bone structure so I don’t look petite but not big boned either. Cinching my waist makes me look like a rectangle, like it’s accenting what isn’t there. FG seems like it could work, but I’m thrown by my more irregular and less pixie-ish features. Is it even possible to be a more Natural FG? Or do I need more softness? The waist thing confuses me. FWIW – I’m also overweight, but even still my arms and upper body have stayed thin (besides some softness from loss of muscle) along with my face. It’s all waist, lower stomach and hips, like a square on some legs. The important thing for an FG face is that there’s mismatch. So if your features are irregular, but they’re all irregular in the same way–it wouldn’t create a gamine impression. You need to have soft in some places and sharp in others. David has given the example of large round eyes and a sharp jawline, or a round jawline and smaller upturned eyes. I can’t really tell you what you are and whether you would be FG or not, but it’s important that your bone structure isn’t strong enough to support N. Whether it actually means a G type or whether you are something else, like DC, for instance–I can’t say. Thank you, that helps so much actually! It helps to understand what contrasted vs blended actually means. I can always find my face in G collages because everyone looks so different from each other, but I think my face may be more blended. Looking at my face, nothing clashes, even if it’s all a bit irregular in some way, like I have Yin-leaning features on Yang bones. For Gs, is contrast between face and body important at all or is it about juxtaposition within the face? Also, I wonder about DC a lot. I do look youthful and I’m 5’1″-5’2″, would that exclude me? It’s less about face and body contrasting with each other and more of contrast within the body itself. You’re going to be on the shorter side, with elongation in some places and not in others. Like I have a long neck and a long torso, to the point that I would fit best in shirts for tall sizes, but legs that require a petite inseam. Short people can go in taller Image IDs provided they have the right yin/yang balance–i.e., look at Sarah Jessica Parker as FN. She is elongated everywhere; she’s just short.